Billy Graham was returning to Charlotte after a speaking engagement. When his plane arrived there was a limousine there to transport him to his home in Montreat. As he prepared to get into the limo, he stopped and spoke to the driver. So Rev. Graham gets into the driver’s seat and they head off down the highway. A short distance away sat a rookie State Trooper operating his first speed trap. The long black limo speeds past him doing 70 in a 55 mph zone. The trooper turns on his siren and sets off after the limo. After pulling it over, he walks to the driver’s door to begin the procedure. However, when the tinted glass is rolled down, he is shocked to see who is a the wheel. The young trooper immediately excuses himself and returns to his patrol car to radio his supervisor. “Is it the governor?” the supervisor asks. “No, he’s more important than that,” The trooper says. “Oh, so it’s the president?” the supervisor says. Insert the name of another widely recognized preacher like Joel Osteen, Rick Warren or Joseph Prince, and the joke might lose some of its effectiveness. Some people might not even get it. The punch line of the joke makes sense and draws a laugh because of what people know about Billy Graham; he’s not a preacher, he’s the preacher. During his career, Graham has influenced millions of people throughout America and the wider world. He is the most distinguished preacher America has ever seen. 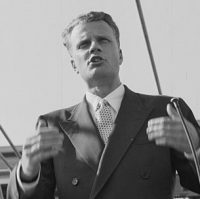 That’s why, if one wants to send him a letter, he need only address it to, “Billy Graham, America.” With Graham’s death there is a vacuum in American evangelicalism that will likely be filled with some combination of politically-minded ecumenism, numbers-focused decisionism, and sound biblical evangelism. Billy Graham was born to a Presbyterian family on November 7, 1918, in a rural area adjacent to Charlotte, North Carolina. Ironically the most famed Southern Baptist preacher in the denomination’s history and the most influential evangelist of the 20th century was infant-“baptized” into a Presbyterian church as a child. While his denominational choice and evangelical zeal might seem surprising, given his origins, his virtuous lifestyle does not. In his autobiography, “Just as I Am,” Billy Graham presents himself the benefactor of a salt of the earth upbringing. His parents lived very conservative lives, taught him the importance of hard work, and stressed dependence on God. Perhaps the most memorable lesson taught to Graham by his parents was the most unorthodox. When Graham was 15, his father, a prohibition-era teetotaler, brought home a substantial amount of beer and forced Billy and his sister, Catherine, to drink all of it. The beer made the teenage Graham so sick that he developed a lifelong distaste for drinking alcohol. Unlike his grandfather, William Crook Graham, Billy Graham would not grow up to be a “hard drinking” alcoholic. He would instead become America’s most famous preacher. Graham’s first public-speaking experience was not in a church pulpit but a school program in which the 12-year old portrayed Uncle Sam. The school’s principal, Mrs. Boylston, recognized his oratory gift, but Graham did not enjoy the experience and promised himself he would never become a public speaker. At that time, Graham had not yet made the decision to become a Christian (although he was active in a church). Four years later, at a revival meeting led by a Baptist evangelist named Mordecai Ham, Graham made that decision — the same decision many thousands of attendees of his own revivals have made over the years. From that time on, Graham’s interest and dedication to his faith grew. Still, even as he became more interested in and dedicated to his faith, Graham did not yet feel called to preach. In fact, when called on to speak about his faith publicaly for the first time, his nervously-presented testimony fell on the seemingly deaf ears of a group of North Carolina prison inmates. Graham was convinced that he’d never become a preacher. However, his conviction did not stop him from noting in his senior class yearbook that his “goal was to become a minister of the gospel.” After completing high school, Graham took a step toward a career in ministry by choosing to attend Bob Jones College, a notable Christian institution of higher education. Pulpit & Pen also posted Billy Graham Led Millions Astray With False Hope, Altar Calls where they concluded: While we mourn the loss of a fellow human made in the image of God, we should not be quick to elevate Billy Graham to hero status among the Christian faith. While only God ultimately knows his fate and the state of his heart, we can be certain that much of what he preached and taught and affirmed was antithetical to the truth of Jesus Christ and His gospel, and, for this reason, we should mourn for all of the souls he has led astray.